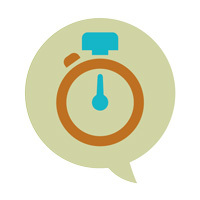 Sometimes you need planting ideas and you need them fast. Quick Digs, our newest category of blog posts, helps you dig into our knowledge and catalog quickly to solve problems, create special gardens and otherwise explore the world of true sages (Salvia spp.) and their companion plants. It takes a central issue, such as weed control, and offers a series of brief articles intended to help you in dealing with it. 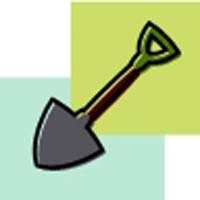 If you have any concerns or questions that you would like us to explore through Quick Digs posts, please call or send us a message. We'll do our best to dig into what interests you. This is the first article in our new Quick Digs series about preparing for spring in Salvia gardens. 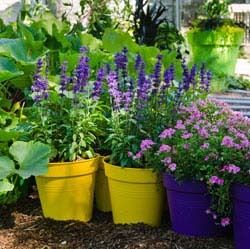 As spring approaches and daylight grows longer, first steps for preparing Salvia gardening include recording sages already planted before planning new purchases, repotting cuttings and seedlings, inventorying garden tools and turning the compost heap. When the first new growth arrives, you'll be prepared to remove weeds before they choke sages and other perennials that are re-emerging. This third article in our Quick Digs series about preparing Salvia gardens for spring concerns the Flowers by the Sea Wish List for maintaining lists of plants you want and for use as a gift registry. 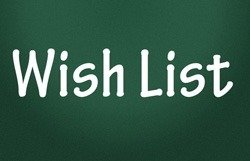 Our Wish List removes the guesswork from gift giving while allowing givers to surprise recipients. For some gardeners, bringing outdoor plants inside during winter is a practical matter. You want to save money. For others, plants are a bit like pets. You feel tender about your tender perennials and can't bear to think of a lovely sage dying from exposure to harsh weather. 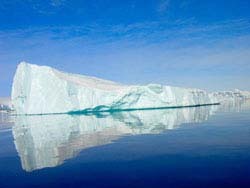 For both there is also the challenge of attempting to win against nature. This is the fourth article in our current Quick Digs series on preparation for winter in the Salvia garden. This article suggests ways to deal with overwintering sages indoors. 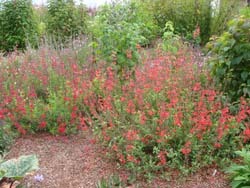 This is our second article in a Quick Digs series about preparing for spring in Salvia (sage) gardens. 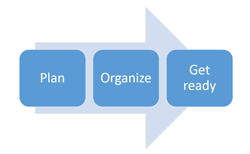 It's easier to succeed at almost anything if you make plans and set goals before beginning a project. This is certainly true in Salvia gardening. 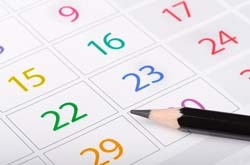 Creating a gardening calendar ensures greater success in planning. Weeding is the topic of this fourth article in our Quick Digs series about preparing for spring in Salvia gardens. Getting ready for the emergence of previously planted perennials in spring and for planting new sages (Salvia spp.) requires weeding before amending soil and planting. Then, growing vigorously spreading sages and ones rich in aromatic plant chemicals called terpines can help control weeds. This is the fifth article in our Quick Digs series about getting ready for spring in Salvia gardens. The previous post talked about weed control. 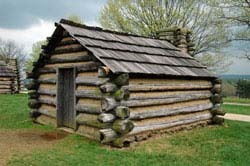 Now we dig into soil and amendments, which aren't just additions to legal documents. 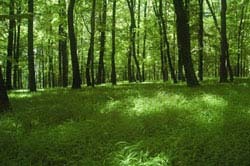 The word also refers to materials added to soil to improve its structure and chemistry. These include organic matter, such as compost, as well as chemical fertilizers and minerals (lime and crushed rock are examples). Choices depend on the plants you want to grow and the current make-up of your garden soil. As autumn days become shorter, so does time for protecting all your tender perennial sages (Salvia spp.) 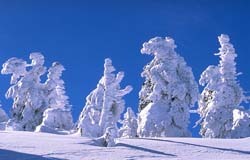 that nature designed for warmer winter conditions. This is the fifth and final article in our current Quick Digs series on preparation for winter in the Salvia garden. 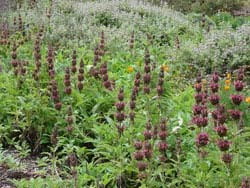 This post acknowledges that it isn't always possible or even preferable to overwinter tender perennial sages. Sometimes it is better to replant favorites as annuals in spring. Synopsis: In chilly climates, such as USDA Cold Hardiness Zones with winter temperatures lower than those of Zone 8, it is difficult for potted plants to survive outdoors when the mercury dips. Soil in containers freezes harder and thaws more rapidly than the ground. So plants in containers are subjected to bigger changes in conditions on a winter patio or entryway. This is the third article in our current Quick Digs series on preparation for winter in the Salvia garden. This article discusses bottom-line rules for improving chances of survival when overwintering sages in containers and suggests a variety of ideas for overwintering outdoors. During spring, a heavy coat of fall leaves or wood mulch isn't a good idea for sages (Salvia spp. ), because it can cause fungal problems that attack crown and roots. 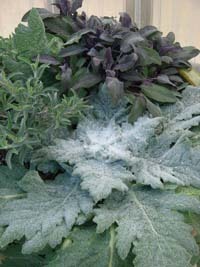 But in winter, organic mulches are ideal for blanketing the foliage and root area of sages. Mulch is particularly useful in protecting protect plant roots against injury from freeze-and-thaw cycles, especially for new fall plantings.This is the second article in our current Quick Digs series on preparation for winter in the Salvia garden. 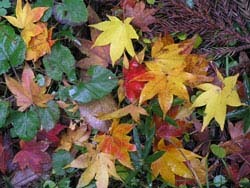 Synopsis: In autumn, even while the days are bright and balmy, you may find yourself frozen with indecision about how to prepare your gardens for winter. Perhaps you are wondering how to protect favorite sages (Salvia spp.) that you know won't survive local winter temperatures and freeze-thaw cycles. Although we can't offer you foolproof solutions, we will provide ideas in this new Quick Digs series on winter mulching and overwintering Salvias both outside and indoors. This is the fifth article in our Quick Digs series on Salvia groundcovers for minimizing weeds in the garden. Here are four choices for Zones 7 to 9, including one that spreads up to 8 feet. Quick Digs is a serial containing short posts focused on a central issue about Salvia gardening. The topic for the first series is Salvia groundcovers for weed control, and this is the third article. If you are a Salvia lover facing the difficult scenario of cold winters and damp soil, the sages listed here are right for winter conditions from USDA Zone 5 to 9. All are water-loving, shade-tolerant species and have handsome foliage that adds to landscaping even when the plants aren't blooming. By massing these plants, you gain coverage more rapidly and increase weed deterrence. Quick Digs is a serial containing short posts focused on a central issue of Salvia gardening. The topic for the first series is Salvia groundcovers for weed control, and this is the second article. Baby, it can be cold outside in Zone 5 during the winter! But the roots of all of the tough Salvias listed here survive sustained frost and snow, then rise up again in spring. To minimize weed growth, the best defense is the good offense of dominating a flowerbed with sages, especially mat-forming groundcovers. Quick Digs is a serial containing short posts focused on a central issue about Salvia gardening. The topic for the first series is Salvia groundcovers for weed control, and this is the first article. I ordered black and blue back in April and was exceptionally pleased with the plants and the care taken in the packaging. The plants are thriving here in eastern NC and the hummingbirds love them. Thanks and I will keep you in mind next spring or maybe sooner. Everything arrived quickly and in very good shape. I did get a surprise with my Torch Lillies, a little lizard. I hope he wasn't too traumatized by his trip. Ordered 7 plants, 4 different varieties of Salvia. From California to Wisconsin 5 days in a box and these plants looked better than what I can buy locally from a greenhouse. Absolutely gorgeous!! !Thank you Kermit and your team for great service and plants. This is my third year I have ordered from Flowers by the Sea. I have received nice sized plants in very good condition. Every single one of the plants have flourished. Nice selection too.